The dry summers and wet winters in the five Mediterranean-type climate regions owe much to the influence of adjacent ocean waters. Most of these five regions are on the western edges of continents, midway between the equator and the poles. Each region is located near a permanent cell of high atmospheric pressure. These high pressure cells serve as gatekeepers for rain-bearing storms. In summer, the cells move toward the poles, blocking water-laden air masses from reaching land. In winter, the jet stream pushes the cells toward the equator, allowing rainclouds through again. The high-pressure cells are maintained by temperature differences between the land and the ocean. These temperature differences are greatest in summer, when the land gets very hot. During these months, air over the cool ocean sinks to form an area of high pressure. Ocean conditions also play a role in maintaining Mediterranean-climate rainfall patterns. Warm ocean water draws moisture into the sky where it can condense into clouds. But ocean waters in Mediterranean regions tend to be very cold. This keeps the air relatively dry. The chilly oceans in Mediterranean-climate regions are due to a phenomenon called upwelling. In mid-latitude regions of the globe, the winds blow parallel to the coast. However, the rotation of the earth turns these winds toward shore. The winds push sun-warmed surface waters offshore, allowing deep, cold water to well up near shore. Upwelling is strongest adjacent to long, straight coasts such as those found in Chile, California, and Southern Africa. 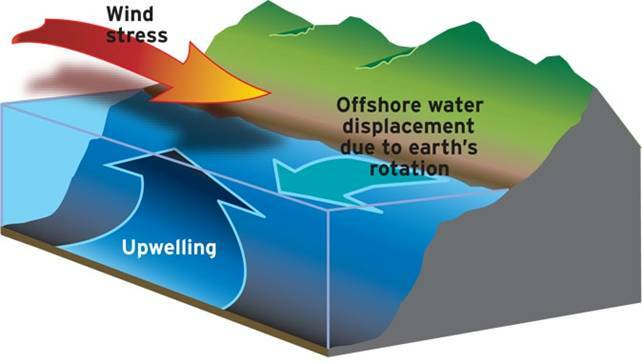 Upwelling also brings waters carrying mineral nutrients to the surface. These nutrients fuel blooms of phytoplankton, which form the basis of the marine food web. As a result, upwelling regions tend to support a tremendous quantity of marine life, further enhancing the biological diversity of Mediterranean-climate regions.